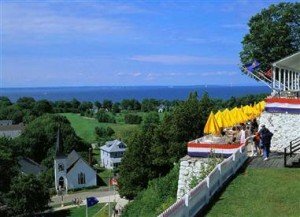 Top Mackinac Island accomodations and attractions. This Michigan Island has beauty beyond words. Mackinac Island (pronounced Mackinaw) is the most famous of the Michigan islands. This Michigan island is worth taking the time to visit if your plans take you up north. The enchanting Grand Hotel was the setting for the movie "Somewhere in Time" starring Christopher Reeve and Jayne Seymour. Now, I know the island isn't in Lake Michigan, but if you are up north it is too close not to visit. The Mighty Mac and the island are two of Michigan's greatest treasures. Located in the northern straits this 4.4 square mile piece of heaven is only accessible by boat or plane. You won't find any cars on the island. Getting around the island is by horse drawn carriage (romantic), bike or walking. You'll find beautiful renovated Victorian homes, hotels and bed and breakfasts most with great views of the straits. The island is famous for its fudge shops and there are plenty to visit. The majestic, natural beauty makes it one of our top picks for the ultimate wedding or honeymoon destination. This amazing Island sees almost a million visitors a year. While most visitors are here on day trips, it is a popular romantic getaway destination for weekend or week long getways. As you can guess make your reservations well ahead of time. The ferrys run from the mainland and St. Ignace daily during the summer months. We really like crossing the bridge and taking the ferry from St. Ignace. Tell Us about your Mackinac Island trip. You'll find plenty to do and enjoy here at Michigan's most famous island. We have enjoyed the bike rides around the island taking in all the spectacular views. Be sure and pack the camera! Great little shops and wonderful restaurants make a stay here one of the most enjoyable you'll experience. Have A Great Mackinac Island Travel Story Or Tip? 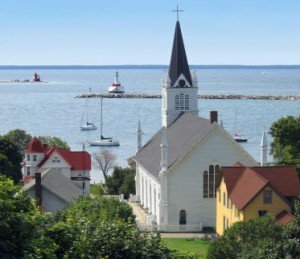 What do you like most about Mackinac Island? Share it! Photos should be no larger than 800x600 pixels. 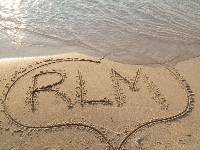 From Mackinac Island back to Romantic Lake Michigan home page.